If not Pacquiao-Mayweather, then who? Manny Pacquiao says Floyd Mayweather Jr. has until the end of January to agree to a deal for a May 2 megafight at the MGM Grand. If they can’t agree to the megafight, here’s a look at how Pacquaio and Mayweather could be fighting next. If Manny Pacquiao is true to his word that Floyd Mayweather Jr. has until the end of January to agree to a deal for a May 2 megafight at the MGM Grand, then it appears as if the two will be fighting other opponents. Talks between the sides remain ongoing, as do negotiations between Showtime, which has a contract with Mayweather, and HBO, which works with Pacquiao, to see which company televises the fight on pay per view. But not much progress has been made, and it’s looking as if everyone concerned might be ready to move on to Plan B, according to a source close to the negotiations who did not want to be identified. Pacquiao gave Mayweather a Jan. 31 deadline to agree to terms on the fight and reiterated that Thursday on a conference call with reporters for Sunday’s Miss Universe Pageant, at which Pacquiao will serve as a judge. Mayweather, who has kept his comments on the negotiations relatively brief since the process began a couple of months ago, said this week in a radio interview that Pacquiao couldn’t agree to terms for a fight because those terms have not been decided. Mayweather further blasted Top Rank, which promotes Pacquiao, saying that Pacquiao has to go through his promoter, whereas Mayweather is his own boss and therefore he’s calling the shots. Mayweather said he, not Pacquiao, nor his promoter, Bob Arum, will decide the terms for the fight. An angry Arum said Mayweather is the reason the fight hasn’t been finalized. Assuming the fight with Pacquiao doesn’t happen, Mayweather could fight Miguel Cotto in a rematch of their May 5, 2012, bout at the MGM Grand Garden, where Mayweather won a unanimous decision and Cotto’s World Boxing Association junior middleweight title. Mayweather has two bouts left on his deal with Showtime and would try to sell the fact that Cotto gave him a fight as a reason to buy a rematch on pay per view. 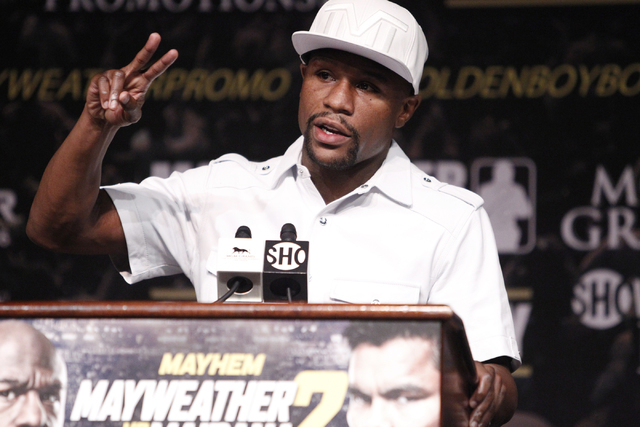 Mayweather would want the fight May 2 at the MGM. There had been negotiations between Cotto and Canelo Alvarez to meet on that date, but those talks stalled out a week ago, which opens the door for Cotto to face Mayweather a second time and probably make more money than if he fought Alvarez. Pacquiao could fight Amir Khan, who looked good last month at the Grand Garden in dominating Devon Alexander. With Top Rank and Golden Boy Promotions, which promotes Khan, doing business again, that could be enough to sell HBO on showing Pacquiao-Khan on pay per view. Should Pacquiao-Khan fall through, perhaps Pacquiao gives a shot to Las Vegas’ Jessie Vargas, the WBA junior welterweight champ. Pacquiao says he could go back down to 140 pounds. Or perhaps they could fight at a catch weight of 144. 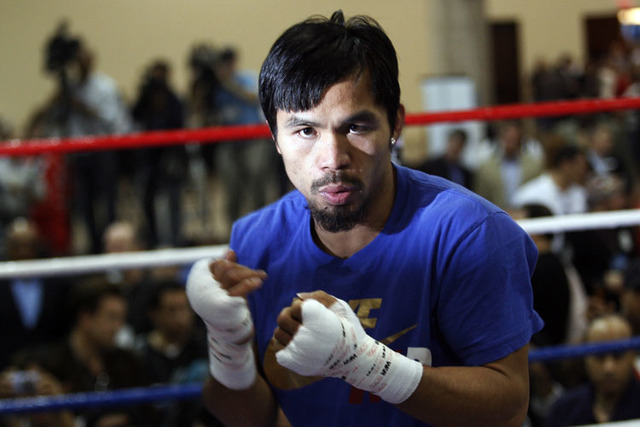 Pacquiao also could fight Ruslan Provodnikov. The two are friends and have sparred over the years in preparations for Pacquiao fights. 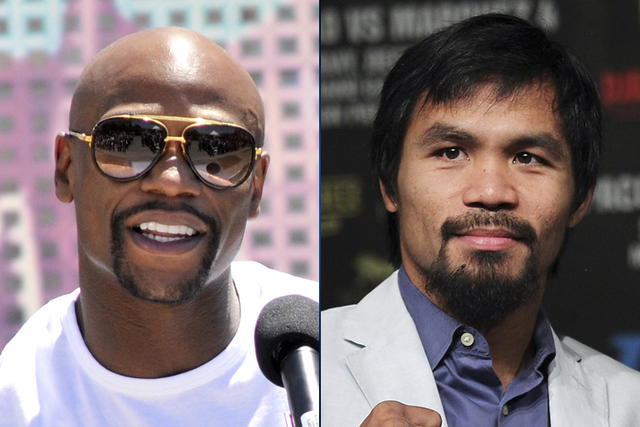 Mayweather-Pacquiao to fight in 2015, says Floyd Sr.